Hello everyone and welcome back to the blog! I seriously cannot believe July is already under way. This summer has been flying by and August 1st is creeping up faster than I would like! I don't know about you, but between the stress of moving, the heat of the sun, and sweating all. of. the. time. my skin has been through a lot this summer. Thankfully, I've been gifted the Remington Facial Cleansing Brush and it is seriously saving my skin! Every time I use it it's like a mini spa day and my skin instantly feels better. We all know that once I start obsessing over something I have to tell you all about it! 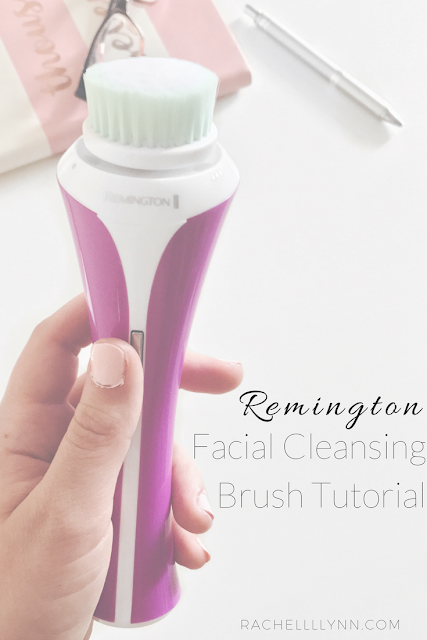 So today, I'm bringing you a tutorial for the Remington Facial Cleansing Brush. Disclaimer: This post is sponsored by Remington. The Remington Facial Cleansing Brush was gifted to me for an honest review. All thoughts and opinions are my own. First thing's first, this facial cleansing brush is beyond easy to use. Why? you may ask. needs, you can change accordingly. God only knows there are days my skin needs all of the deep cleaning it can get! It literally tells you when your skin is good to go and you need to move on. How much easier can it get?! This may seem counter intuitive, but if you want the deepest clean, start with as much makeup off as possible. On days when I've been sweating in the sun or after a long night working, I usually bump up the speed. Honestly, you can clean your face however you'd like, but the timer within the cleanser is based off of the different sections of you face: forehead, left side, right side. If you use the cleanser with the different sections in mind, your face will get a more even clean. **Pro tip: If you're in the mood to take your spa day up a whole other level, the messaging head of the Cleansing Brush is a 10/10! Your girl is forever trying to stay away from wrinkles and the messaging head definitely relaxing the muscles in my face. I love this. I believe skin care should be beyond skin. Skin care is my obsession too! As science and cell restoration Helen Hunt Skin Care innovation has cleared a path for new progressions in the healthy skin world, a few nations and regions of the world are pulling ahead as far creating quality and compelling enemy of maturing skin cream treatments is concerned. To brighten the skin, they are connected to restore the harmed best layer. As the skin gets evacuated and new skin replaces it, see this site the tone of the skin is lighter than previously.